Salt Lake City rallies for Laquan McDonald, calls for community control of police | Fight Back! 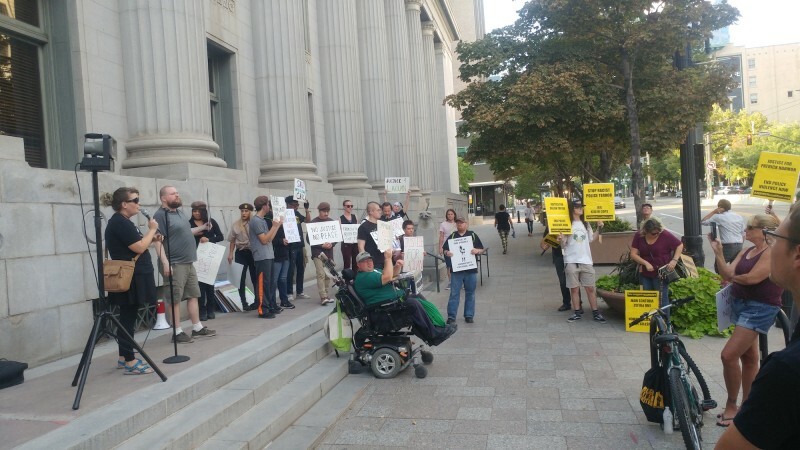 Salt Lake City, UT - Downtown Salt Lake City echoed with the chants of more than 50 demonstrators shouting, “Justice for Laquan,” “Community control now,” and “Jail killer cops,” on Sept. 5, the opening day of the trial for the Chicago cop who murdered young Laquan McDonald. The protest was held in solidarity with the national day of action against police crimes called by the Chicago Alliance Against Racist and Political Repression and the National Committee Against Police Crimes. Speakers from Utah Against Police Brutality, the Freedom Road Socialist Organization, the Rose Park Brown Berets, Black Lives Matter-Utah, Salt Lake Democratic Socialists of America, and the Party for Socialism and Liberation addressed the crowd. They called for Jason Van Dyke to be convicted and jailed for his crimes. They also called for community control of police, in the form of the Salt Lake Police Accountability Council, a body that could fire and discipline cops who murder people like McDonald or who engage in any form of misconduct, without relying on the corrupt police and city officials who refuse to hold police accountable.